Garden centres are always relaxing places to visit. And at Christmas time, the contrast between a lovely nursery and a large busy shopping centre is quite stark. I know where I would rather be doing my Christmas shopping. Most garden centres have lots of gift ideas, for gardeners and non-gardeners alike. Fruit trees are always popular, and citrus are perhaps the most popular of all. Dwarf varieties are good for smaller gardens and for pots. Small fruiting plants such as blueberries, raspberries, passionfruit and papaws are also much appreciated. Olives, figs, mulberries and mangoes are suitable for those with room to accommodate a larger tree. Most people love to have fresh herbs for the kitchen, even if they don't have a garden, so why not put together a potted herb garden containing a selection of their favourites? You could do this yourself, or you should be able to find one already made up. For the flower lovers there are lots of options. Potted orchids, bromeliads and anthuriums will grace any room or shady outdoor area for months to come. 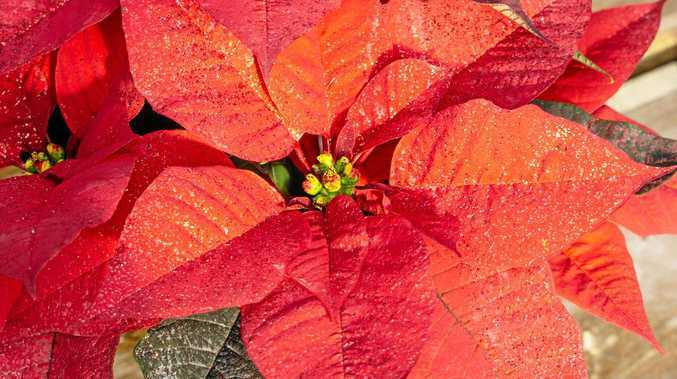 The red poinsettia is a classic Christmas plant and makes a great table decoration. Potted colour is great for those occasions when you want to give a little something without going overboard. Add some pretty wrapping, or a simple pot, and you'll have a lovely gift that won't break the bank. Bonsai and carnivorous plants (like venus fly traps) are also excellent gifts. Air plants (tillandsias) and succulents are very popular and lend themselves to some really creative decorating ideas. If the whole plant thing is a bit scary you could check out the garden ornaments and other accessories. Beautiful tools are always popular. "Insect hotels" provide a home for beneficial insects like lacewings, solitary bees and hoverflies in a garden.